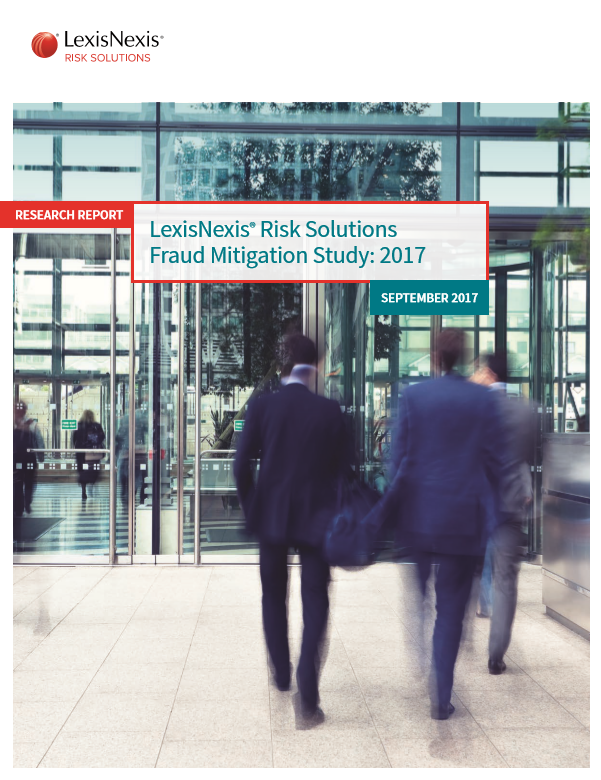 LexisNexis Risk Solutions has issued their annual Fraud Mitigation Study. 1) Determine the extent to which fraud extends into more than one industry. For example, in an insurance investigation, evidence may exist that the potential perpetrator also committed benefits fraud, financial fraud, etc. 2) Examine trends related to different types of fraud, including fraud resulting from stolen identities. 3) Explore the extent to which fraud mitigation professionals rely on external data and analytics solutions to help with their fraud mitigation programs. LexisNexis® Risk Solutions commissioned its annual Fraud Mitigation Study to gauge trends and patterns related to fraud within several different industry sectors and government. Objectives of the 2017 study were to: 1) Determine the extent to which fraud extends into more than one industry. For example, in an insurance investigation, evidence may exist that the potential perpetrator also committed benefits fraud, financial fraud, etc. 2) Examine trends related to different types of fraud, including fraud resulting from stolen identities. 3) Explore the extent to which fraud mitigation professionals rely on external data and analytics solutions to help with their fraud mitigation programs.